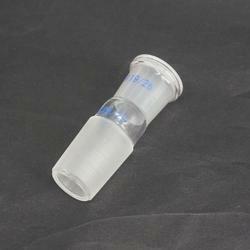 Keeping in mind the precise demands of clients, we offer a wide range of Glass Reduction Adaptor. These are precisely designed and developed as per international industrial standards and using best available technologies. Our devices are admired for their high functional efficiency, reliability and consistent performance. Multiple Adapters, Three Neck, Two Parallel and one at 45". 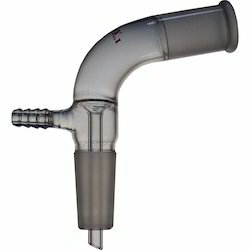 Adapter cone to rubber tubing. Adapter vents are fitted in the opening of the bottle to provide the required shape to the mouth to make the easier flow of liquid. These adapter are available in different sizes according to the need of the customer. Our products are made with the best quality of raw material and are durable and reliable in nature. We offer the best quality gamut of Multiple Adapter. - Chemistry and forensic laboratory. We have in store fabulous range of Adapters - Receiver – Multi- limb with Vacuum Connection that has received global acclamation owing to its high efficiency and premium quality. Furthermore, our range is thoroughly tested using new techniques and machines, which allow us to ensure its defect-free nature. All these products can be availed with customized packaging & solutions. With our vast experience & knowledge in this field, we are engaged in manufacturing a quality-assured range of Expansion Adapters. - All expansion adapters are made from borosilicate glass. They are useful for the connection of dissimilar sized ground glass joints. Interchangeable large socket at the top and interchangeable small cone at the base.